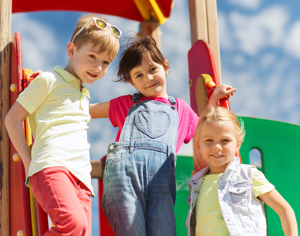 Our Early Learning Programs are designed with a combination of free play, outdoor play, and structured activities. We focus on growth and development in the areas of social interaction, physical development and cognitive skills. Social/Emotional Development – Consists of sharing, problem solving, following directions, self-control, and manners. Physical Development – Consists of gross motor and fine motor skills. The children will be engaged in activities such as climbing, skipping, jumping, pulling and balance. Children will also be developing their pencil grip, stringing beads, lacing, cutting, and picking up small objects. Cognitive Development – Consists of language skills, math skills, science, and art. Children will be learning a variety of concepts including phonics, reading, counting, sorting, matching, discovery, experimenting, building, creating, painting, molding, and many others. The learning curriculum in our Early Learning Programs is theme based and also includes music, science activities, math and language skills. Throughout the day, the children learn Christian characteristics and values such as kindness, love, forgiveness, and honesty.